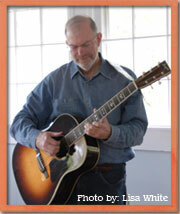 Jay returned to Goddard College, Plainfield, Vermont, to present "Song, Society and Spirit"
Jay began playing guitar at age 9, and has been at it ever since. He studied with Frank D’Amato, a legendary guitar teacher in New Haven, whom he counts as one of his most outstanding teachers ever, in any subject. In high school, Jay played jazz at the Exit coffeehouse (where he was introduced to folk music, and was Jazz Director for awhile) and sat in at the Cotton Club, New Haven’s spot on the organ jazz circuit. At Goddard College, a musical high point was jamming with other student musicians and members of King Crimson. Jay taught himself to play classical guitar after coming to Chicago for graduate school in psychology. Jay began to write songs in the 1980s, encouraged by his wife Cynthia Standish. He formed a group, This World, in the mid-1990s, to perform his songs (the Illinois Entertainer, reviewing a demo cassette, said, “Just what a singer-songwriter oughta be”). Jay then played with jazz keyboardist John Getman. A practice recording in John’s living room, with John’s friend Cliff Fredericksen on bass, became Jay’s first CD, “My Heart Is Open” (2003), after John’s tragic death. The performance is rough and production almost non-existent. 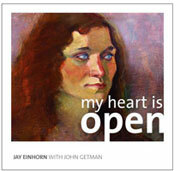 Noteworthy tracks include “Beck and Call” and “Lay My Burden Down.” Cover art is a painting, by artist Marilyn Johnson, of Cynthia when she was a student in Kalamazoo. Original cover art was created by Chicago artist Sandra Clay to Jay’s description of playing in front of the city of Chicago. With “Elephant in the Dark” (2011), Jay’s artistic and production skills reach another level. The songs reach out and touch people; as was evident when Jay performed for groups with interests in psychology, religion and spirituality. Working with recording engineer/production assistant/harmony singer Dave Budrys, Jay began “Elephant” in 2007, working around his day job as a clinical psychologist. Every track features a full band, including the outstanding rhythm section of Doug Lofstrom on bass and Alpha Stewart, Jr. on drums and percussion, plus harmony singers, including singer-songwriter daughter Emily—featured on “Doin What She’s Doin,” together with Rob Sulski’s harmonica - and the outstanding vocalists Lisa Yusk Bowker, who also sings lead on “Journey,” and Matt Bowker. Most tracks feature the outstanding fiddler Jordi Kleiner. Keyboardist Aaron Ackerson contributes organ (“Battlefields of Eden” and “Regenerate”) and piano (“Beauty”). Track times are radio-friendly (unlike the longer track times on “Start Over”). 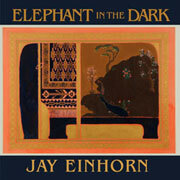 Jay commissioned the painting of The Elephant in the Dark for his office, from the outstanding artist Francisco Centofanti, and it became the cover art. 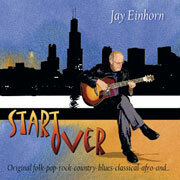 So Jay had lots of outstanding help in bringing his third CD to your ear and eye.